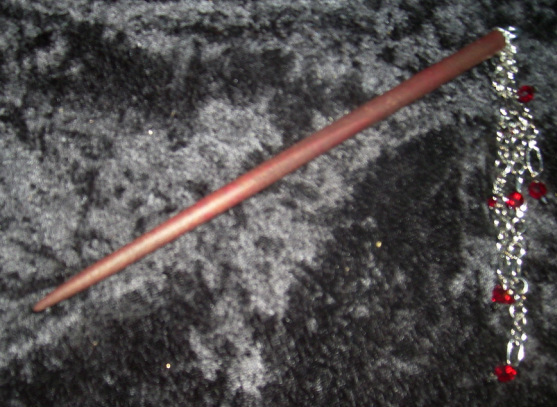 Put the bead cap over the rounded end of the wooden hair stick. Screw the eye screw through the hole in the bead cap into the hair stick so it holds the bead cap on (you may have to enlarge the hole in the bead cap, but that can be done by putting one part of your round nose pliers through the hole and twisting/pushing). Cut your chain into 2, 3 and 4 inch pieces (I opened links rather than cutting). Attach the three pieces of chain to the jump ring and the jump ring to the eye screw. Decorate the chains with crystals as desired.